In my photo album for 2000 – remember photo albums? How quaint! – this photo has the caption underneath ‘The Cat who came for Christmas – and stayed’. Indeed Puss – we never gave him a name because we thought someone would claim him – did stay, became quite a character and an important member of the family. 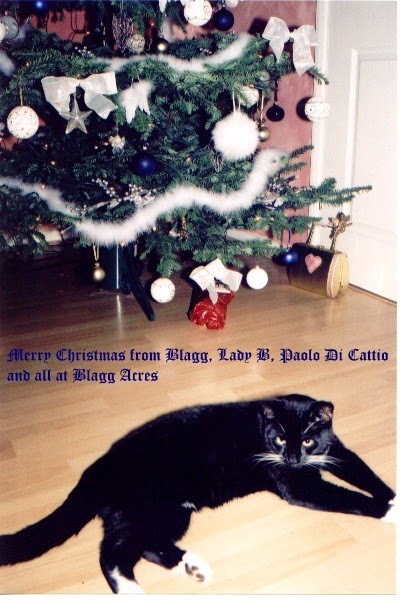 He took on the mantle of Paolo Di Cattio in my Blagg column and book and has popped up regularly on this calendar and other places since – only last year giving a festive wave. An estimated two years old when he joined Blagg Acres, sadly the little lad fell ill in the spring and despite our best attempts, went to the Big Cattery in the Sky in July and won’t be with us this Christmas. We miss him still and raise a toast to his memory and the mini-Cat’s home that has evolved in an attempt to fill the gap he left.